Irna Qureshi and Tim Smith’s Grand Trunk Road, explores the history of the oldest highway in South Asia and its relationship with immigrant communities in the UK. The book consists of 120 photographs and a variety of oral histories. 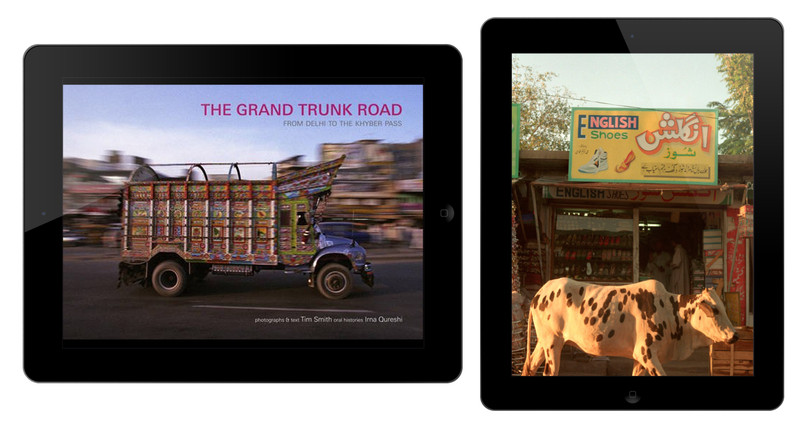 As part of an internal research programme in 2011 exploring the future of books (Books As A Place), Carbon approached Qureshi with a view to interpreting Grand Trunk Road as an electronic augmented edition. In a short paper, Carbon outlined how the journeys and stories of the book’s interview subjects be articulated in the emerging language of Apple iPad, with interactive maps, recorded interviews and annotations from readers helping transform the evocative, though inert texts into a “place” of living stories.